The fourth season of Brooklyn Nine-Nine has been very top-heavy so far, with little room to breathe: a trilogy, a crossover “event,” and now the fourth installment of the “Halloween” series. 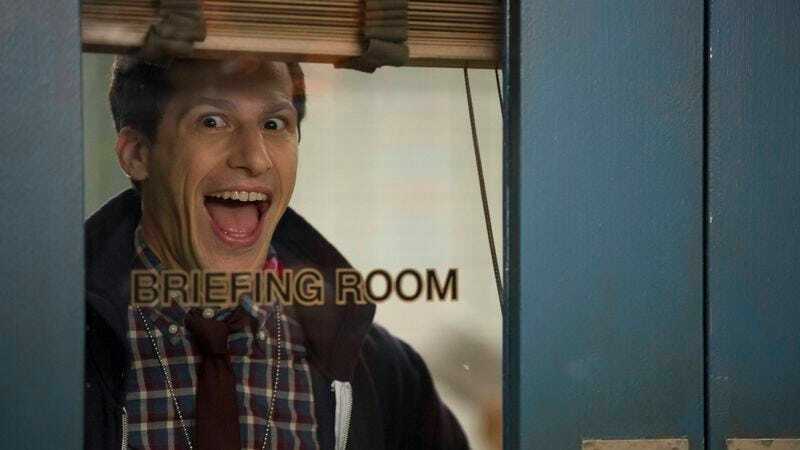 While it may be too soon to tell if Brooklyn Nine-Nine can keep up this pace or even transition out of it comfortably, this refusal to slow down is mostly working for the show right now. And in the case of “Halloween IV,” this refusal to slow down works tremendously in the show’s favor. The cold open’s competing Halloween Heist announcements and Hitchcock’s very dark contribution to the scene start the episode off on an extremely high note, but instead of simply going back to a base level in the rest of the episode, the level of insanity “Halloween IV” begins with is the level it stays at. And it’s wonderful. While the first three “Halloween” episodes could be a bit uneven, especially in terms of the twists and the absolute chaos of the Nine-Nine doing absolutely no work, “Halloween IV” actually works because of the build-up from those episodes. Yes, at this point, it’s necessary to accept that Halloween is the night when Brooklyn effectively transforms into Gotham City because of the the Nine-Nine’s negligence. But even still, “Halloween IV” is so overwhelmingly funny—in a way where every character has something to do, which Brooklyn Nine-Nine can sometimes have trouble with—that it takes hold of all the audience’s (and characters’) sensibilities for the 20-plus minutes of action. Last week’s “The Night Shift” had flashes of the Nine-Nine turning on each other, but here, in the face of actual competition over a congratulatory plaque, the characters are absolute monsters throughout the episode. Again, it’s wonderful. Splitting up the crew for a “three-way tiebreaker” in the Halloween Heist also makes for some high-quality pairings, which is really the driving force of this episode. For example, the Holt and Boyle pairing is miles ahead of the couple of times it happened in season three. Here, Holt treats Boyle with a decent amount of respect (“Yes, pork chop. Yes.”), as well as the knowledge that Boyle is a liability as a partner (the blank sheet of paper at the beginning, complete with Gene Wilder/Willy Wonka impression). It also marks the return of Cheddar the dog, who remains an absolute treasure and now a plaque-retrieving machine. Amy and Rosa’s team-up brings especially amusing results, as the only thing funnier than Rosa mocking Amy’s entire personality is apparently her accepting it fully, to the point where she has conversations built on a knowledge of The Baby-Sitters Club and even busts out an uncharacteristically sweet eye roll at Amy for never wanting the night to end. And while the Jake and Gina dynamic is cut short by a supposed dental emergency, the ever-increasing weirdness of Jake’s interactions with Boyle/Gina stand-in Bill (Winston Story) is something special. That’s even just for little, relatively normal moments like the fact that Bill has no idea who Jake’s talking about when he’s told to keep an eye on all of the people involved in the Halloween Heist. Because no one is left out of the Nine-Nine’s little reindeer games, even random Brooklynites who may or may not be male prostitutes. As for Terry, he’s essentially Hitchcock and Scully’s hostage here, but even that leads to great moments like Hitchcock’s complete lack of understanding when it comes to “so good-looking” Terry not having a mistress. In fact, Hitchcock is actually very much in the running for stealth MVP of this episode, right from the cold opening. And while each team and hostage situation brings something to the table for the episode, it’s just a great episode for individual performances and endlessly quotable lines. There’s something for everyone here, both in terms of the characters and the audience. And like I said, everyone becomes an absolute monster in this episode. The exception might be Terry, but considering the fact that he called hummus “dumb,” maybe he’s been a monster this whole time. It’s hard to believe Jen Sutton’s fourth grade birthday party was the key to everything, but here we are now. Gina winning the Halloween Heist and the plaque just feels right, given her self-proclaimed ability to excel at everything, but it also opens up possibilities for future winners and twists outside the Jake/Amy/Holt triangle, which was greatly needed this time around. And while we say this every episode, Andre Braugher remains the brightest shining star in a cast of bright shining stars, and there’s really nothing better than a competitive and petty Captain Holt. Just ask Madeline Wuntch. Holt’s not just on board with all the shenanigans during the Halloween Heist, he tends to be the driving force. Then just when the episode makes you think he might come to his senses, it subverts expectations by having him break his office window or join Amy in a pile-on on Terry and his daughters. This isn’t something the show could reasonably do in the beginning or even in the other three “Halloween” episodes; but this is earned, both from those previous episodes and in all the hectic stress of this season so far. And we’re just getting started. 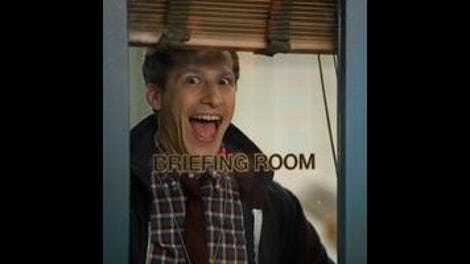 Brooklyn Nine-Nine is the true “Ultimate Show/Genius,” as it gave the pizza delivery people with speaking roles these names: Pete Za, Andy Chovy, Deepa Dish, and Brad Stick. Amy and Holt laughing over Jake thinking he’s more attractive than “young Al Gore” would be the sweetest moment of the episode if not for everything about Amy and Rosa’s pairing. Jake: “Nothing.” Bill’s “nice, soft face” is the dark mirror version of Boyle’s “real wet mouth.” He’s welcome back any time. Amy: “It’s true. You had it for breakfast this morning. Holt: “‘Whatever.’ Spoken like a common criminal.” Holt’s not wrong. Amy: “She’s a work in progress.” This episode reveals that Amy’s fight with smoking is still alive. This episode has everything.